A great location for a home that is also as a vacation home is what we dream to have. We believe that it is the natural surroundings that could make our house charming and comfortable. 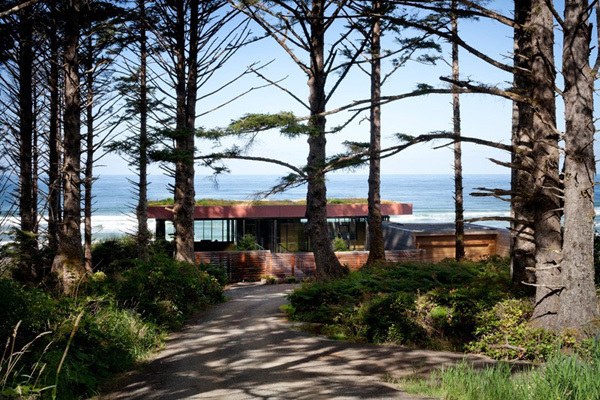 Well today we will be inspired of the designer’s vacation home spotted in the Oregon Coast. 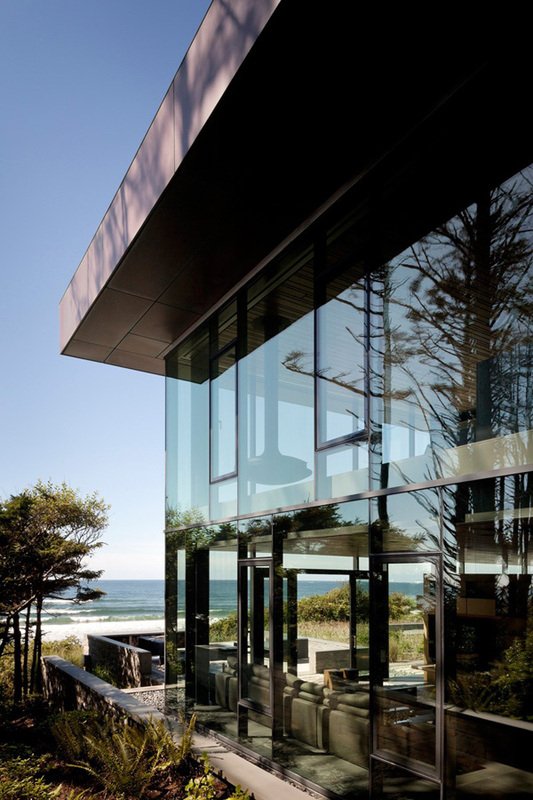 This house has two levels and maximized the glass materials as the main elements of their house building. 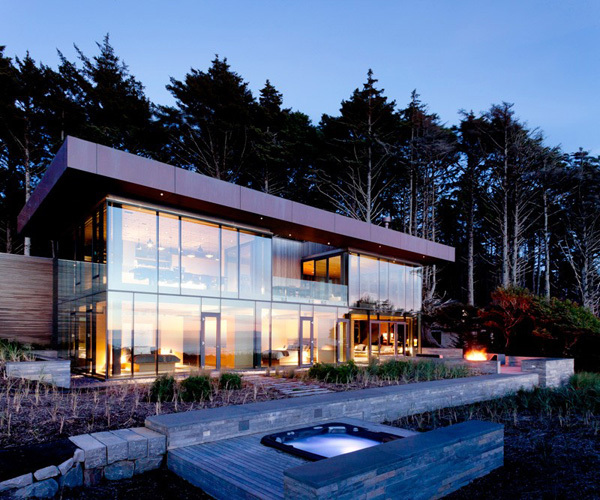 The designer said that the design maintains its sightlines from the forest to the open coastline with a minimal structure of glass and steel. 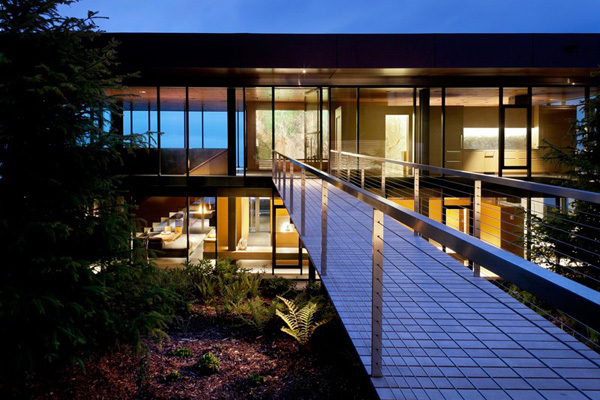 Well this house is accessible via a catwalk and oversized glass pivot door. The main space consists of the living, kitchen and dining room which are located in the upper level of the house. 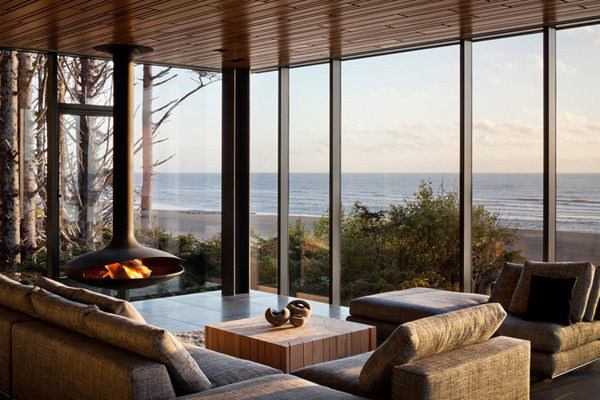 Let us see more of the elegant designs of the interior through the images below. 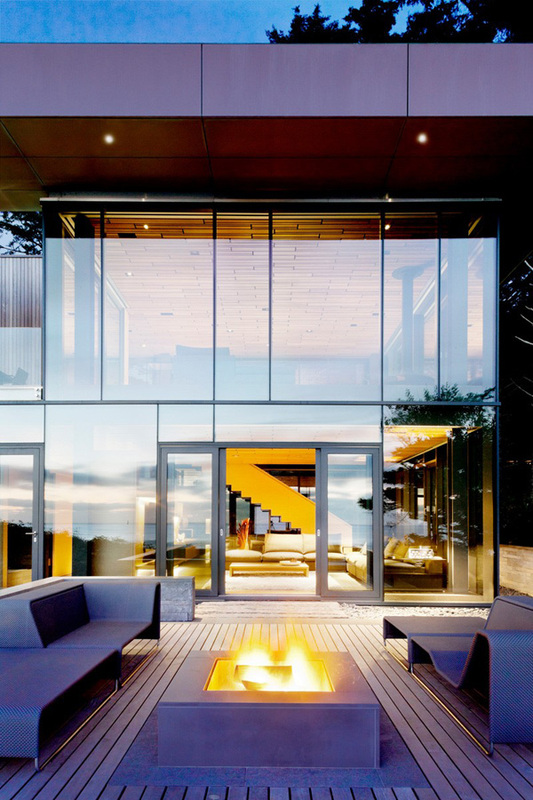 Take a look at how the house is stunningly built in the middle of this tall trees and lush green landscape. A pathway is intently designed in this area not just to provide an entrance but to welcome the guests in exploring the nature. Opened glassed door provide a welcoming invitation for its highly quality materials and fine texture. 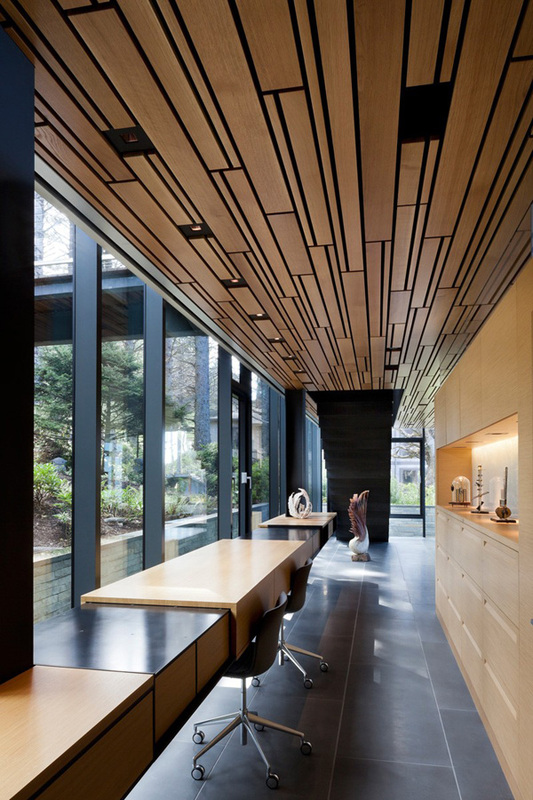 Lines and the smooth texture underscore the house elegance and charm. 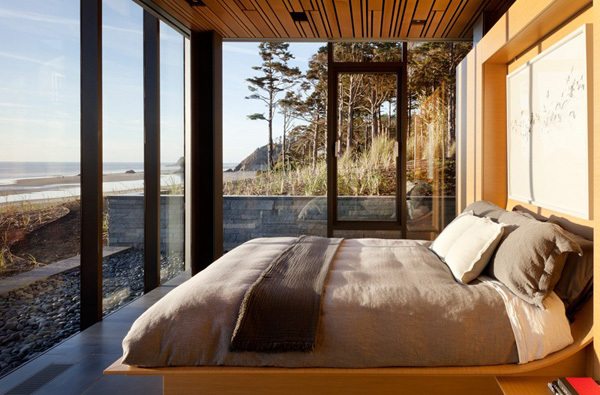 Natural light can enter the interior for its open layout and transparency concept. Who will say that the most attractive scene can provide comfort in this zone? The lines and textures of the walls as well as the furniture highlighted the durability and its sophistication. Beige color of these built-in shelves complements well with the ceilings and the staircase as well. The dining space provides a great opportunity for the client to enjoy his meal while capturing the beautiful sight outside. The wooden materials presented in the table as well as in the ceiling jives perfectly with the trendy fixtures here. Just take a look at the patterns seen from the ceiling is creating a movement. 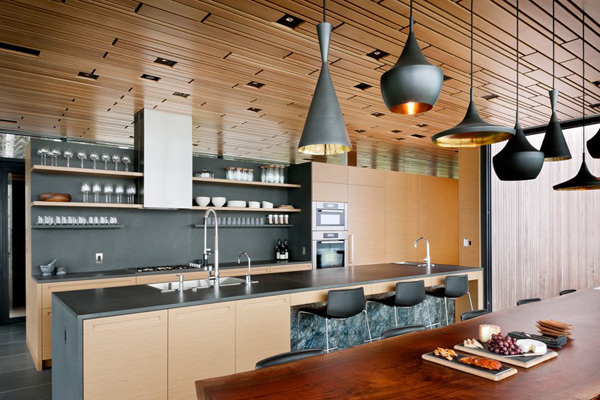 Modern and excellent design of a kitchen is well presented here. 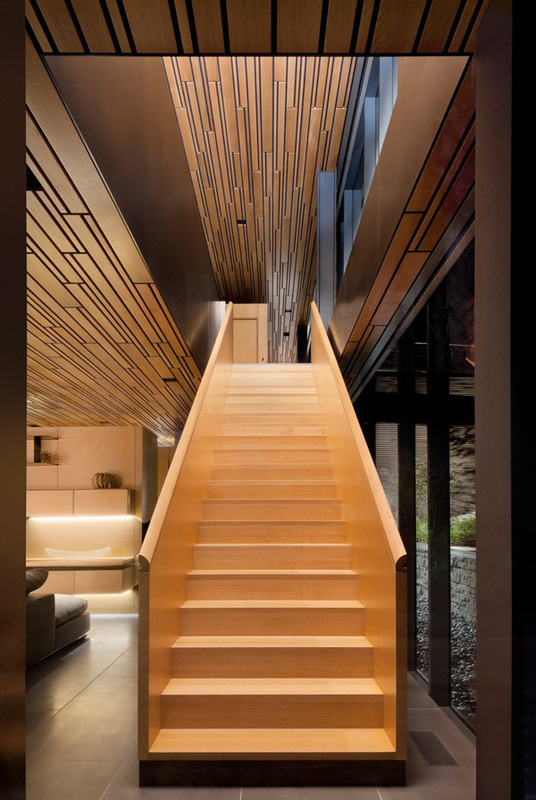 Here’s the wooden staircase that perfectly jives with wooden ceilings and wall here. 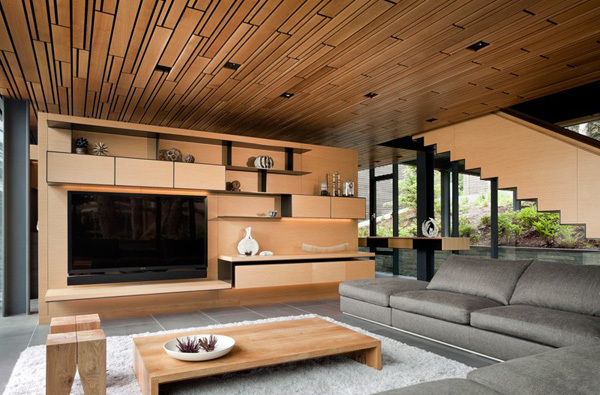 The color combination of brown and white is effective in making this room comfortable and connected to nature. Huge bed and the wall art painting above it is enough to underline that simplicity means elegance, too. Glassed walls clearly display the well-organized and clean bathroom here. Bridge design in the second level of the house is very helpful in providing a greater opportunity for the client to view the nature in the surroundings. A fireplace in the center of these chairs enhances the look of the patio making it more sophisticating. Here is how the glassed wall house looks like in the night as its lighting system underscore its prevailing design. 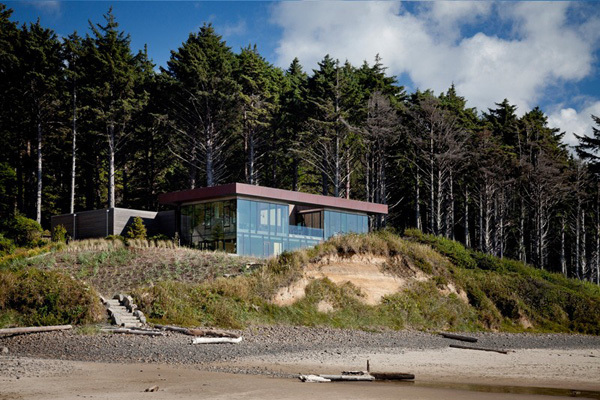 As we have seen the images above, we can see the full height of the house which is really exposed from the beach. In fact the family room as well as the two rooms is open directly to the patio and the beach access. Personally, I love the house design that perfectly complements with the location. 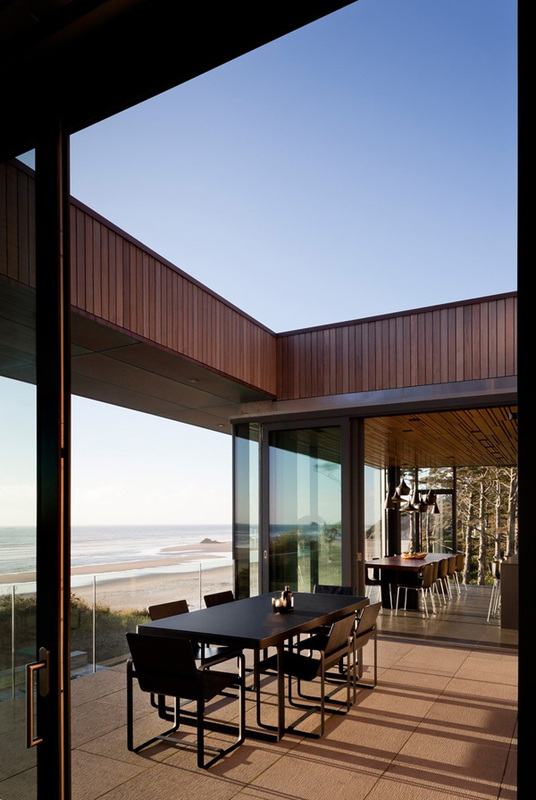 The Boora Architects also said that regardless of the unpredictable Oregon Coast weather, this house is still filled with natural light. Especially at night, the light levels are kept low which also create a very intimate effect. We hope that we have also given you another set of amazing details of a house design that you may also apply in your house.